Everyone who is a fan of recipes that are cheap, and quick, and take less than 5 ingredients, raise your hand! Ok now put your hand back on your mouse or keyboard, so you can keep scrolling and read your newest favorite weeknight recipe. 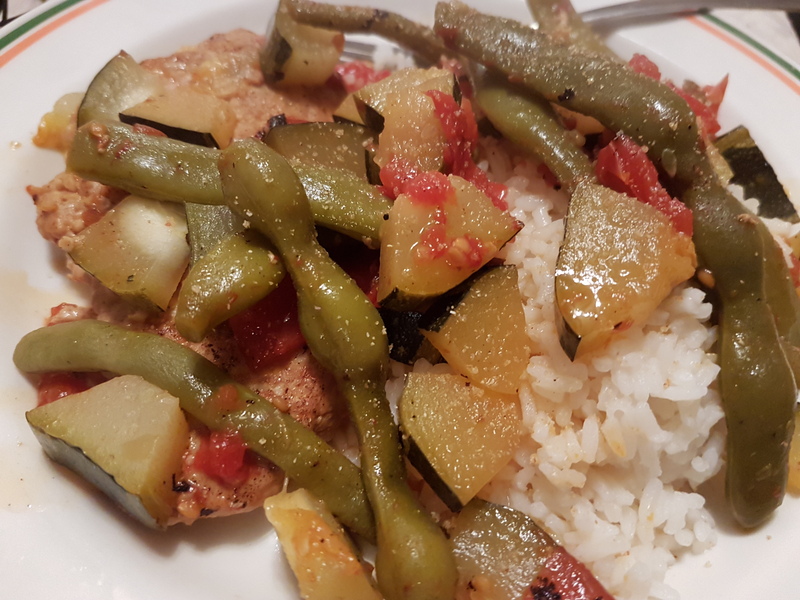 Since I also always keep cans of diced tomatoes in the pantry, and bags of frozen veggies in the freezer, this meal came together in a snap! With supreme flexibility (Green beans and zucchini, no? How about broccoli, carrots, cauliflower, or onions? Boneless, bone in, doesn’t matter. Or use chicken! Or shrimp. 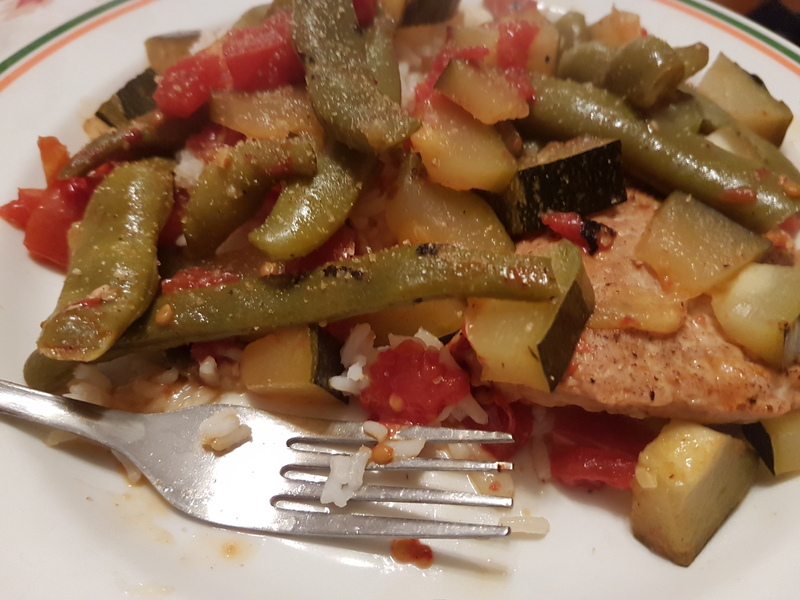 Or tofu, why not), healthy options galore, and a very low price point (I’d estimate $2 per meal for 4 meals), this is a go-to recipe in my repertoire. Step 1: Put the pork chops and the Italian dressing in a frying pan, and cook on medium heat for 7-9 minutes, until browned on one side. Flip and cook 5-7 minutes until brown on the other side. You will have to decide when to add the vegetables based on whether you use fresh crispy ones (broccoli, carrots) vs softer or frozen ones (peas, fresh green beans, zucchini). Step 2: Add the canned tomatoes with juice and any other vegetables at this point. Simmer for 4-6 minutes, until heated through. 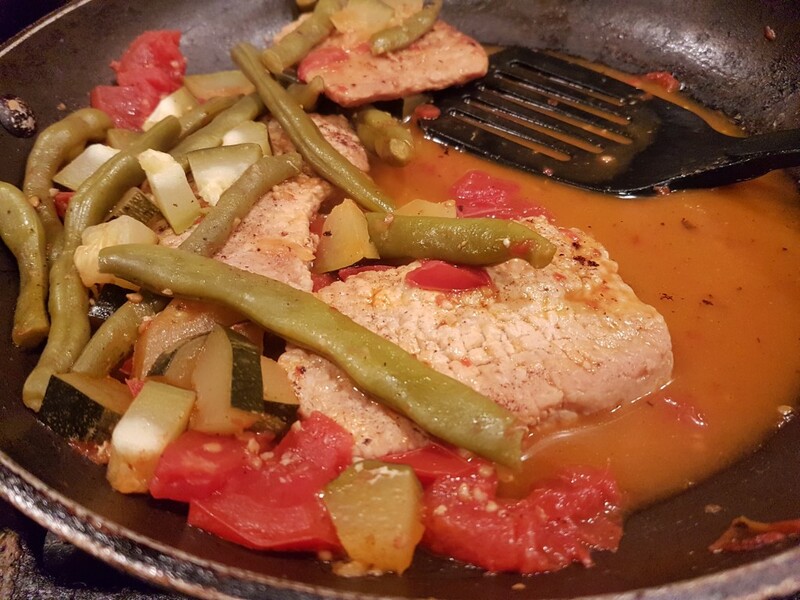 Serve like this for a low-carb meal, or serve over rice or with baked potatoes on the side. 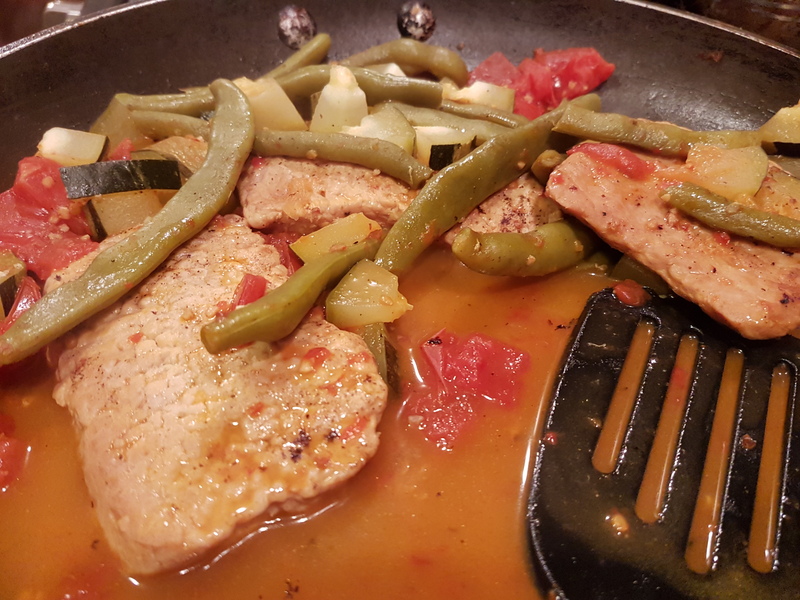 In a frying pan, put the pork chops and the Italian dressing. Cook on medium heat for 7-9 minutes, until browned on one side, and flip. Cook 5-7 minutes until brown on the other side. You will have to decide when to add the vegetables based on whether you use fresh crispy ones (broccoli, carrots) vs softer or frozen ones (peas, fresh green beans, zucchini). Add the canned tomatoes with juice and any other vegetables at this point. Simmer for 4-6 minutes, until heated through. 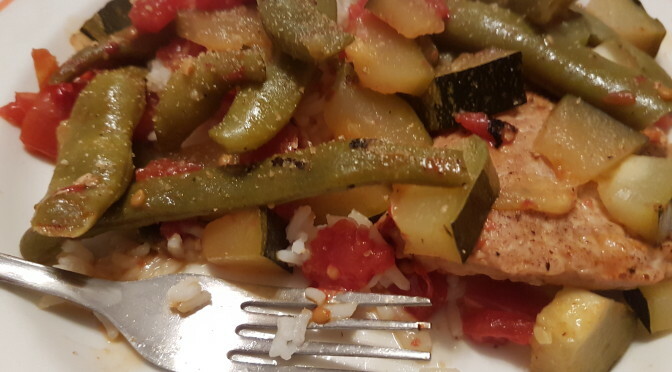 Serve as is for a low-carb meal, or over rice.